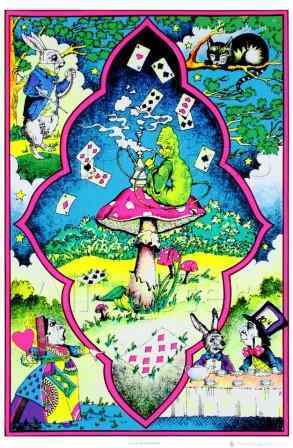 Many of the characters from Alice in Wonderland are on this poster, but the main man is the hookah smoking caterpillar in the center. This is an old school flocked black light poster that will just jump off the wall when you have nothing but a blacklight on it! It measures approximately 24" x 36" and would look great in any room.